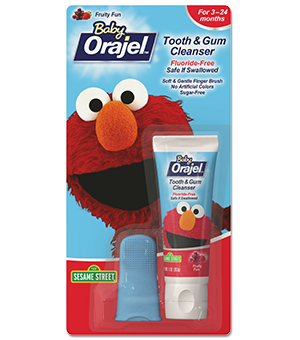 Baby toothpaste might seem like an extra, unnecessary cost, not to mention one more thing to cram into the already overfull medicine cabinet. But actually babies should not use adult toothpaste. Most toothpaste that’s made for adults contains fluoride, which is a mineral that prevents cavities. Fluoride is one of medicine’s greatest success stories. It’s dental science’s main weapon against tooth decay. But as with so many things in life, you can have too much of a good thing. Here’s the story. Back in 1901, a young dental school graduate named Frederick McKay opened a dental practice in Colorado Springs, CO. McKay made a startling observation: Many of his patients had permanent brown stains on their teeth, some as dark as chocolate. The locals blamed the stains on eating too much pork or drinking bad milk. But they were wrong. It was actually something in the water . . .
which was unique to that area of Colorado Springs. After careful study, scientists determined the ideal amount of fluoride in water—not too much but not too little, just the right amount to protect teeth from decay without altering their color. Today, more than 200 million Americans benefit from fluoridated water. Because your baby is likely exposed to fluoride in water, you don’t want him to also be exposed with his toothpaste because that might lead to discoloration of his permanent teeth. 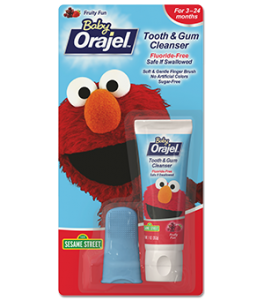 That’s why babies under age two should use special infant toothpaste that contains no fluoride, such as Orajel Tooth and Gum Cleanser. You can buy it in stores and online for around $4 a tube. It contains a special ingredient to remove plaque for cleaner teeth and gums. Plus it’s safe if swallowed when used as directed. Visit Orajel.com for more information.